Eighteen months since the first Latin American to occupy Peter's Chair drew 3 million to Rio's Copacabana Beach, this Sunday in Manila is almost certain to witness the largest crowds of this pontificate in the very same place where, 20 years ago this week, John Paul II presided over one of the most mammoth gatherings in human history. When I speak spontaneously I do it in Spanish, because I don’t know the English language. May I do it? Thank you very much. This is Fr Mark [Ed. : Msgr Mark Miles, the Gibraltar-born head of the Secretariat of State's "English Desk"], a good translator. First of all, a sad piece of news. 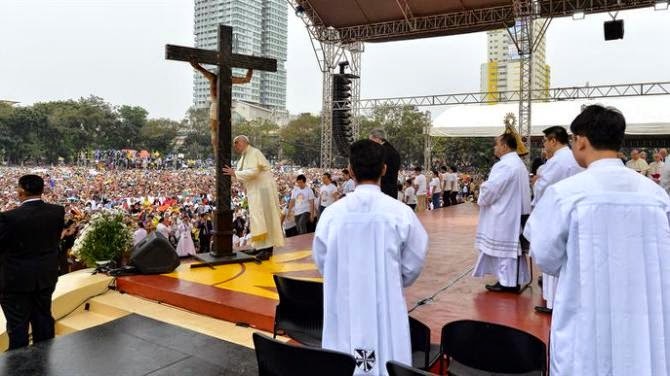 Yesterday, as Mass was about to start, a piece of scaffolding fell and, upon falling, hit a young woman who was working in the area and she died. Her name is Kristel. She worked for the organisation preparing for that Mass. She was 27 years old, young like yourselves. She worked for Catholic Relief Services as a volunteer. I would like all of you who are young like her to pray for a moment in silence with me and then we will pray to Our Mother in Heaven. Let us pray. Let us also pray for her parents. She was an only child. Her mother is coming from Hong Kong and her father is here in Manila. In a special way, I thank the young people who have offered words of welcome to me. To Jun and Leandro Santos II and to Rikki, thank you very much. There’s only a very small representation of girls among you. Too little. Women have much to tell us in today’s society. Sometimes we are too “machistas” and we don’t allow enough space to women. But women can see things from a different angle to us, with a different eye. Women are able to pose questions we men are unable to understand. Look out for this fact: she is the only one who has put a question for which there is no answer. She couldn’t put it into words but expressed it with tears. So when the next pope comes to Manila, please let there be more girls. I thank you Jun for talking about your experience so bravely. As I said, the heart of your question has no reply. Only when we too can cry about the things you said can we come close to answering that question. Why do children suffer so much? Why do children suffer? When the heart is able to ask itself and weep, then we can understand something. There is a worldly compassion which is useless. You expressed something like this. It’s a compassion that makes us put our hands in our pockets and give something to the poor. But if Christ had had that kind of compassion he would have greeted a couple of people, given them something, and walked on. But it was only when he was able to cry that he understood something of our lives. Dear young boys and girls, today’s world doesn’t know how to cry. The emarginated people, those left to one side, are crying. Those who are discarded are crying. But we don’t understand much about these people in need. Certain realities of life we only see through eyes cleansed by our tears. I invite each one here to ask yourself: have I learned how to weep? Have I learned how to weep for the emarginated or for a street child who has a drug problem or for an abused child? Unfortunately there are those who cry because they want something else. This is the first thing I want to say: let us learn how to weep as she has shown us today and let us not forget this lesson. The great question of why so many children suffer, she did this in tears. The response that we can make today is: let us really learn how to weep. In the Gospel, Jesus cried for his dead friend, he cried in his heart for the family who lost its child, for the poor widow who had to bury her son. He was moved to tears and compassion whe n he saw the crowds without a pastor. If you don’t learn how to cry, you cannot be a good Christian. This is a challenge. When they posed this question to us, why children suffer, why this or that tragedy occurs in life – our response must be either silence or a word that is born of our tears. Be courageous, don’t be afraid to cry. Then came Leandro Santos II and his question. He also posed a good question: the world of information. Today, with so many means of communication we are overloaded with information. Is that bad? No. It is good and can help. But there is a real danger of living in a way that we accumulate information. We have so much information but maybe we don’t know what to do with that information. So we run the risk of becoming museums of young people who have everything but not knowing what to do with it. We don’t need young museums but we do need holy young people. You may ask me: Father, how do we become saints? This is another challenge. It is the challenge of love. What is the most important subject you have to lean at university? What is most important subject you have to learn in life? To learn how to love. This is the challenge that life offers you: to learn bow to love. Not just to accumulate information without knowing what to do with it.. But through that love let that information bear fruit. Real love is about loving and letting yourself be loved. It’s harder to let yourself be loved than to love. That is why it is so difficult to come to the perfect love of God. We can love Him but we must let ourselves be loved by Him. Real love is being open to the love that comes to you. The love that surprises us. If you only have information you are not surprised. Love surprises because it opens a dialogue of loving and being loved. God is a God of surprise because He loved us first. God awaits us to surprise us. Let us allow ourselves to be surprised by God. Let us not have a computer psychology that makes us think we know it all. All answers on computers - but no surprises. The challenge of love. God reveals himself through surprises. Think of St Matthew. He was a good banker. But he let people down because he imposed taxes against his own people to give to the Romans. He was full of money. Jesus passed by, looked at him and said: “Follow me”. He couldn’t believe it. It you have the opportunity, see Caravaggio’s picture of him. Jesus calls him and those around say: “Him? He betrayed us! He is no good! He hoards money!” But the surprise of being loved overcomes him. The day when Matthew left home for work, saying goodbye to his wife, he couldn’t imagine he would come home without money and have to prepare a feast for the one who loved him first. God surprised Matthew more than the money he had. Allow yourselves to be surprised by God. Don’t be afraid of surprises. They shake the ground beneath our feet and make us insecure, but they move us forward in the right direction. Real love allows you to spend yourselves, to leave your pockets empty. Think of St Francis who died with empty hands and empty pockets but with a full heart. Remember: no young museums, and wise young people. To be wise use three languages: think well, feel well and do well. And to be wise allow yourselves to be surprised by the love of God. That will guarantee a good life. Rikki came up with a good plan for what we can do in life with all young people’s activities. Thank you, Rikki, for what you and your friends do. I’d like to ask you a question: you and your friends help others but do you allow yourselves to receive? Answer in your heart. What is it that I lack? To all of you who Jesus loves so much, I ask you: do you allow others to give you from their riches to you who have not? The Sadducees, Doctors of the Law, in the time of Jesus, gave much to the people, they taught the people the law, but they never allowed the people to give them something. Jesus had to come to allow himself to feel compassion and to be loved. How many young people among you are like this? You know how to give and yet you have ever learned how to receive. You still lack one thing. Become a beggar. This is what you still lack. Learn how to beg. This isn’t easy to understand. To learn how to beg. To learn how to receive with humility. To learn to be evangelized by the poor, by those we help, the sick, orphans, they have so much to give us. Have I learned how to beg? Or am I self-sufficient? Do I think I need nothing? Do you know you too are poor? Do you know your own poverty and your need to receive? Do you let yourselves be evangelised by those you serve? This is what helps you mature in your commitment to give to others. Learn how to open your hand from your very own poverty. There are some points I have prepared. The first, I already told you: to learn how to love and to learn how to be loved. There is a challenge which is a challenge of u. This is not only because your country more than many others is likely to be seriously affected by climate change. There is the challenge, the concern for the environment. And finally, there is the challenge for the poor, to love the poor, with your bishops. Do you think of the poor? Do you feel with the poor? Do you do something for the poor? Do you ask the poor to give you the wisdom they have? This is what I wish to tell you all today. Sorry if I haven’t read what I prepared for you but there is a phrase that consoles me: that reality is superior to ideas. The reality that you have is superior to the paper I have in front of me. Thank you very much. Pray for me!